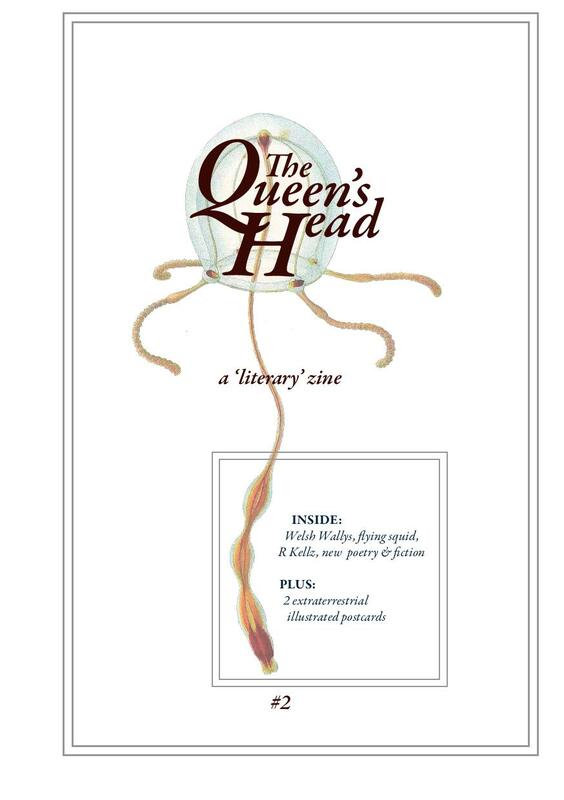 Originally intended as a one-off zine between Glasgow friends, the first issue of The Queen's Head was edited and compiled at a cabin on the east coast of Scotland, printed on borrowed sugarpaper and bound by string and beads. It soon, however, grew legs, arms, many other unidentifiable appendages, and by its fourth issue was home to some wonderful, weird and really rather intense writing and illustration from all over the world. An unpredictable publishing schedule, non-existent budget and constantly evolving purpose were by turns charming and infuriating, but one thing held true across all eight issues: a delight in championing new writers with a knack for brilliance. and I thank all our featured writers, illustrators and multitudinous supporters for getting involved. Grave misuse of industrial-grade rubber; media-savvy murder ballads; post-decomposition literary deconstruction; birds and bellies; denial, drugs, Dune and death; the secret lives of furniture; old world, fresh eyes, new. Issue 7 - PRINT COPIES SOLD OUT! Ballardian viscera; paranoid fatherhood; interdimensional gaming and grief; hallucinogenic escapes; doomed voyages; a conference of AI; radiation sickness; digital labyrinths. A transaction of souls; interior designs; mouths like watering holes; amber trinkets; hirsute hominids; theological powerpoints; cataclysm, flippantly. Pensioners, fighting dirty; antennae; an obsession with heartache; frozen cities; a village without children, a forest with a secret; forgotten man-made monsters; zero open, zero closed; queer representation in underground comics; a most beautiful slaughter; several selves; on chewing. Courting rituals; lonely giraffes; atomic grace; papier-mâché people; a sun that never sets; a big bird in a small cage; mythical lumberjacks; shiny red clicked-heel shoes. Feminism, craft and rebellious grandmothers; fond remembrances; minotaur (singular), breaking and entering; wrestlers and bluesmen. Welsh Odlaws; fingers and sausages; auditory epiphanies; flying marine biology; monkeys and masks. R. A. Davis - When Was Wally? The lyrical narratives of breakups; shaving trees and sad cyborgs; Jose Saramago's socialist agenda; possession, skin and a tug-of-war mixtape.